Andy has been a pastor at River Ridge since 2010. 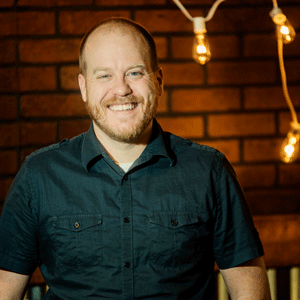 In his role, he serves as the co-teacher and communicator at Sunday services along with Chad. God called Andy to be a communicator through his own life’s journey and an ability to tell stories. He has a unique ability to help people be on the same page with life issues and struggles while supporting them to find solutions primarily in God’s word. Andy loves being a part of the process to help people find hope in Jesus and working out their faith with God to live life to the fullest. Andy is from New Martinsville, WV and earned his Bachelor’s degree from West Virginia University in Civil Engineering. He spent 12 years working in the engineering industry before being called into full-time ministry. Andy loves spending time with his family, running, fishing, and grilling literally anything. He completed an Ironman triathlon and has climbed Mount Rainier. Outside of Jesus, he is most passionate about his family.